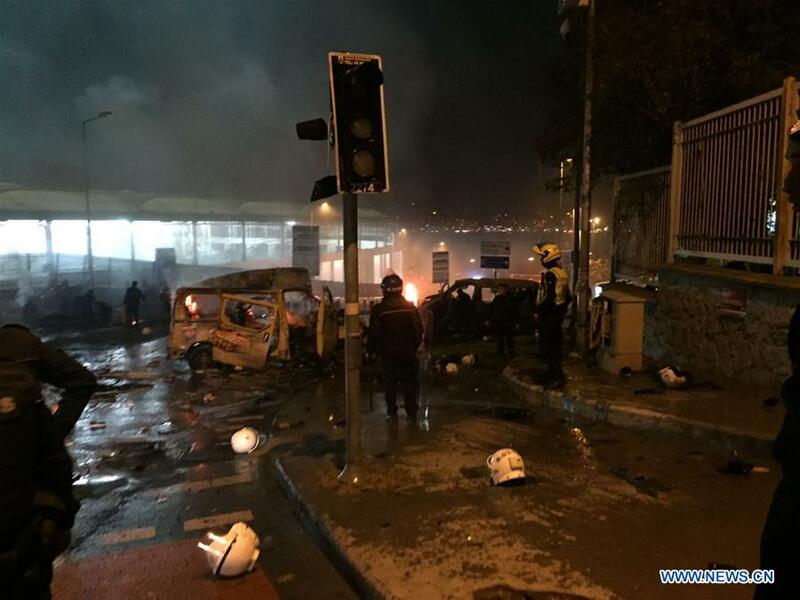 ISTANBUL, Dec. 10 (Xinhua) -- Two explosions hit central Istanbul on Saturday night, injuring 20 police officers, the authorities said. Two blasts happened within seconds near a stadium in the district of Besiktas, where a football match ended about one and a half hours before, as heard by some residents. Interior Minister Suleyman Soylu put the number of the injured at 20, saying information on the dead was not available for now. He spoke of two possible explosions and cited the possibility of car bombings, saying a riot police bus was targeted. On pictures sent from the scene, three people were seen lying on the ground, while debris are scattered everywhere. A Xinhua cameraman close to the scene saw many police cars and ambulances, but he was not allowed to shoot and ordered to go away.